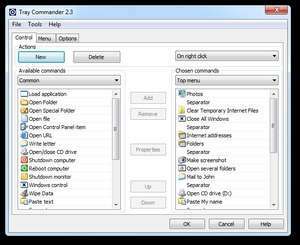 Tray Commander is a launcher that was developed to let you quickly run your frequently used system commands directly from the system tray. Tray Commander adds a single icon to the tray which, when clicked, displays a menu to which you can add commands. It can open\close your CD drives, reboot, shutdown your system, run your favourite applications, launch any screensavers, set video mode and many others. Also you can run several commands by one click. Tray Commander 2.4 is a shareware program and can be used as a demo to try the software until the free trial period has ended. A full version of the program is available after the trial period ends. For security reasons, you should also check out the Tray Commander download at LO4D.com which includes virus and malware tests. Additional screenshots of this application download may be available, too.